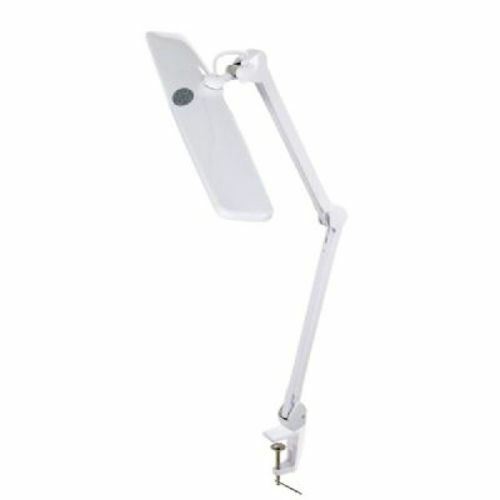 This professional grade LED light is the new standard in task lighting. Constructed from metal and high impact polymers this durable light is perfect for everyday use. LED lights allow true white light to be cast on your work without glare or hot spots. Eighty-four SMD LEDs can be combined in three different settings to create just the right field of light. Soft touch dimmable switches allow you to dial in the desired brightness. The base is a 2.75 table clamp that will allow you to mount this light right to your work surface. Spring loaded arms and a swivel head will get your light exactly where you need it. Size: 32h x 23w. Color: White.